How to host a Buzzin’ Classic game. How to host a Buzzin’ Advanced game. 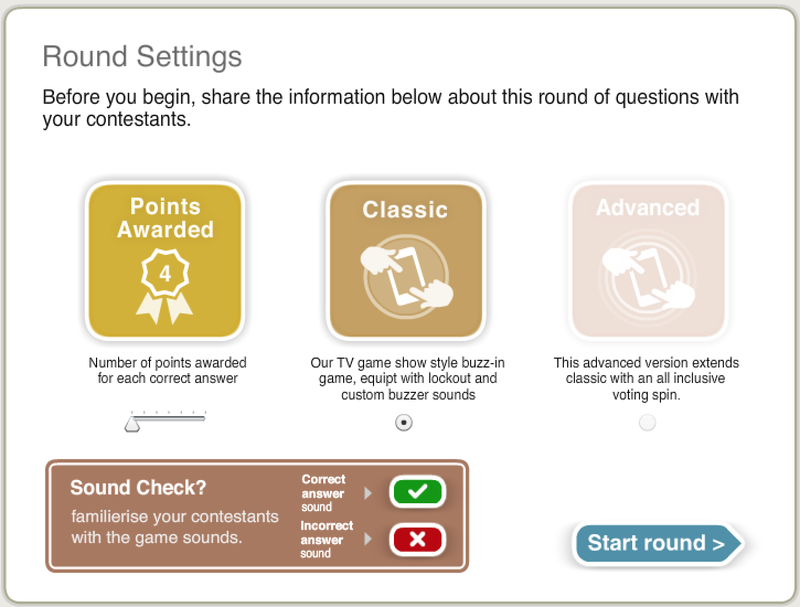 The Buzzin games are based on a traditional fastest-finger game-show with a buzzer-lockout where buzzing in and answering the question correctly earns points whereas an incorrect answer incurs a penalty. Up to 32 teams listen to a question being read out by the host but unlike the keypad game where everyone get’s to answer each question, only the fastest team to buzz in by tapping their screen get to give an answer. There are two variations, Classic and Advanced, both of which are very competitive and by their very nature create frustration and tension between players whom a lot of the time might know the answers to the questions but more often than not get beaten to the buzz by the competition. Warning: When hosting the Buzzin games with a large crowd of teams, you can expect to be running around like a crazy person. Therefore your Microphone will need to be a Wireless model. And because you need to roam around away from the laptop-screen you are advised to use the optional Quizmaster’s handset. Before you start it’s important that you understand the difference between the Classic and Advanced games. Both games start the same with you (the host) reading a question from the laptop screen (or optional Quizmasters handset), players then tap the buzzer graphic triggering their unique Buzzer ID sound to indicate that they wish to tell you an answer. This can be either after the question has been read out or during a question if someone chooses to interrupt. In the Classic game it’s a simple case of the you (the host) marking the submitted answer correct and awarding points, or marking them incorrect in which case they’ll be penalised by being locked out from the remainder of the current question as well as the whole of the next question. When a team is locked out/excluded for answering incorrectly all other teams buzzers become active again allowing the remainder of the question to be read out until another team choose to buzz in and give an answer. In the Advanced game however, before marking their answer correct or incorrect you announce their answer to the rest of the teams and give them the option to either agree or disagree with the buzzing team’s answer, thus creating the chance for everyone to score points rather than just the team who buzzed in with an answer. (All be it only a reduced 50% of the amount awarded to the buzzing in team). With at least 2 devices connected to the host software in the teams list …click Load on the Buzzin’ section. Now you you should click here, ￼this round rules button found near the top of the screen will display some instructions for you to read out prior to starting the round. Tip: Whilst reading out the Round Rules, you can demonstrate (Sound Check) the correct and incorrect game sounds by using numbers 1 and 2 on your computer keyboard. Once everyone understand’s the game, hit the blue Start round button. You are now ready to read out the question loud and clear from the laptop screen. 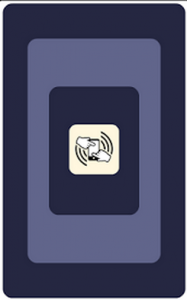 From the moment you commence reading the question, players can interrupt by tapping their device screen to buzz-in triggering their unique buzzer ID sound. (Once interrupted, you must cease reading the question and locate the team). They must now immediately tell you an answer. (Failure to do so will result in you counting it as a ‘Pass’ and marking them incorrect using the red button either on the laptop screen, the Quizmasters handset or by using number 2 on the computer keyboard). When they do tell you an answer it is important that you announce it loud and clear so that all other teams/players are aware of exactly what answer has been given, whilst at the same time either marking it incorrect using the red button, or correct using the green button (or number 1 on the computer keyboard). Once an answer has been marked incorrect, remaining team’s buzzers become active waiting for the next team/device to buzz in and give you an answer. (If you were interrupted mid-question you must remember to immediately continue reading out the rest of the question either from the laptop screen or the quizmaster’s handset until another team buzz in, or you finish the question). Tip: Holding down the white panel in the bottom section of the Quizmaster’s handset displays the question). This continues until a team eventually gives a correct answer or you move on to the next question because no one know’s the answer. 4 Points are awarded for a correct answer by default, whereas a team/device is locked out (excluded) from the following question as a penalty for an incorrect answer. Tip: This explanation of the Advanced game assumes that you have already read and are familiar with the workings of the Buzzin’ Classic game. With at least 2 devices connected to the host software in the teams list click Load on the Buzzin‘ section. 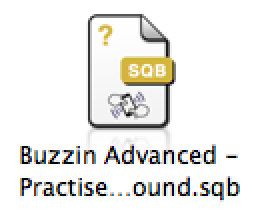 Select a yellow SQB Buzzin Advanced file. 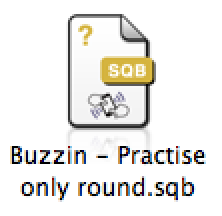 A good starting point is this file which can be found in a folder called “Practise Quizzes Not to be asked at a quiz”. You should then see the Round Settings page. At this point you should click the Round Rules tab, this will display some instructions for you to read out prior to starting the round. As with the classic game, from the moment you commence reading the question, the first team/player to tap their device screen to buzz-in triggers their unique buzzer ID sound. (If this happens mid-question you must cease reading and locate the team). They must now immediately tell you an answer (failure to do so will result in you announcing it as a ‘Pass’ and marking it incorrect allowing another team to buzz in. (This is where the advanced bit comes in which is very different to the Classic way of doing things and it is very easy to get this wrong if you are not careful). Whereas in the Classic game you would mark an answer correct or incorrect there is an extra step now which involves you keeping the answer a secret a while longer. You still repeat the answer which the buzzing team have submitted loud and clear for everyone to hear. However whilst being careful not to divulge whether it is correct or not you click the Blue button to accept their answer. If you were interrupted on your initial read-through, it is now important to make sure everyone has heard the whole question (repeating it where necessary). Once you are sure that everyone has heard the question you say. ‘Remaining teams now have 10 seconds to either agree with the answer that has been given by tapping their screen, or disagree by doing nothing, starting NOW’ and you hit the blue button again to start the timer. At the end of the 10 seconds you must now announce the correct answer at the same time as marking the answer which the buzzing team initially gave correct or incorrect. Warning: It is easy to make a mistake at this point especially when you are required to announce the correct answer whilst pressing the red button to mark the submitted answer incorrect. At the end of this process…+10 points (default) go to the buzzing team who submitted a correct answer, however the penalty for them if their answer was incorrect is minus 10 points. 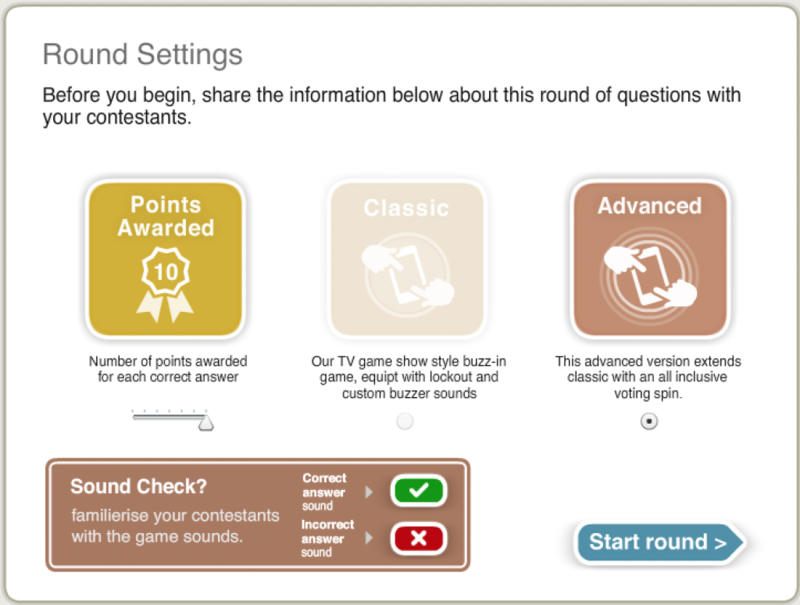 (Teams are not excluded from the next question in the advanced game). Then in addition to this, 5 points (half the main score setting) goes to each team who either agreed with a correct answer or disagreed with an incorrect answer. Tip: In most instances you should keep a straight face and accept an incorrect answer allowing the game to play out. However in certain circumstances if a team buzzes in and gives a deliberately wrong answer you may want to class it as a ‘Pass’ hitting the red button to allow another team to answer sensibly. Below are some old video tutorials for the Buzzin’ games, which (although slightly outdated) are still useful to watch.